My legs would be so spry. And lose 5 pounds you see. in such a happy mood. to have them every day. is all I'd have to pay. The smell just makes me gag. I'd rather eat old rags. that put me in a funk. I guess I can't like bananas. I'd like to but I won't. Okay, Moms. Which kids book is this poem modeled after? Take a guess! I am so sorry to hear about this sad dietry news and I don't know the book this came from! When my kids were little they chose a book from the library called "Little green balls of mushy poison"and and I had a real problem getting them to eat peas for a age after reading it!! The last time I ate a banana was after the Star City 5K (when it was combined with the half marathon) in 2007. I was in such agony I could not stay long enough to get my award. Never again! Banana's are evil! Gee, has to be Dr. Seuss. I Wish That I Had Duck Feet? I only like bananas in smoothies or covered with PB. This is such fun to read! I happen to love bananas. what about banana pudding? can you really be from the south and not like banana pudding?! I wish I had duck feet:) Deaglan and I read this almost every night for six bloody months! I'm afraid Naveen will get his hands on it and demand to read it for another six. Great job on the poem. I love bananas so I can't relate. Every week we run out of bananas mid week even though we load up at the grocery store. And this is weird...last night I had dreams about bananas. In my dream our grocery store was charging one price for all the bananas you could take home. It was bittersweet because they were all ripe. Very nice verse, I eat mine often. I am a Sam, A Sam I am.... I do not like Green Eggs and Ham!! I do love bananas though!! Did you write that poem? Good job if you did. Bananas have so many benefits... you really can't stand them? I have banana Chocolate chip bread on the counter right now, would that help? I haven't got a clue. I enjoyed the poem! Aw, that's a great tribute to bananas from someone who won't eat them. LOL. I just finished a banana right before pulling up your post. How did you know? The poem is reminiscent of Dr. Seuss. Hi Lisa, I'm sure it's Dr. Seuss... I love "Green Eggs and Ham"
Thanks for your thoughts on Word Verification... Why don't you publish a post on it also???? It kind of sounds like Green Eggs and Ham?? I'm not sure what it's modeled after, but I sure liked it! I like bananas a little bit, but just a little bit. I don't know where it is from but it is pretty funny! Oh my, I can't guess the book, but I hate bananas, too!!! And just like you, I have tried to like them, they have so many good things in them. Phil will eat them in the car and the smell is not good, especially when he leaves the peel in the car for three days, GAG! I even have a post coming up about bananas. That is so cute! Love the post. 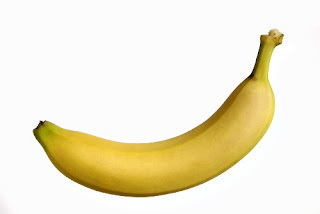 Bananas have to be just the right amount of black spots on them. Very entertaining Lisa. Oh! I want to say Green Eggs and Ham, but it's in reverse. What is it? It's funny! I go through phases with bananas. Sometimes I think they're delicious and then for no reason whatsoever I just can't stand them. The sight! The smell! Yuck! How cute is that! For myself, I used to love banana and peanut butter sandwiches. Cute poem Lisa! I don't like bananas either but because they give me serious heart burn! Even if I eat it at 10am I'm feeling the pain 12 hours later. Oh, Lisa - one dislike we have in common, because I developed an aversion to them when I was pregnant and never outgrew it! :( There are so many smoothie recipes I have to avoid because of them, blech! I don't know what book it is but I feel like I should. The "tune" and tone sound right! when my kiddo started eating them it was BAD around here! They do smell kind of gaggy, but taste great in a milkshake.... otherwise I don't care for them much, Mrs. Seuss. Hey Lisa, just wanted to tell you, my reader says you posted this morning, but the link isn't working. I don't have a clue about the book, but I love bananas...cute poem. Have a great day. Cute poem! I eat them with peanut butter ... yummy! I'd say it sounds pretty Dr. Suessy... Green Eggs and Ham? Oh, I love bananas! I love those banana popsicles covered in chocolate.